The era of cheap oil isn't over. Crude oil prices plunged 4% on Monday, sliding to $39.86 a barrel Monday. It's the first time the price has been below $40 a barrel in nearly four months. It rose slightly on Tuesday to go just above $40. 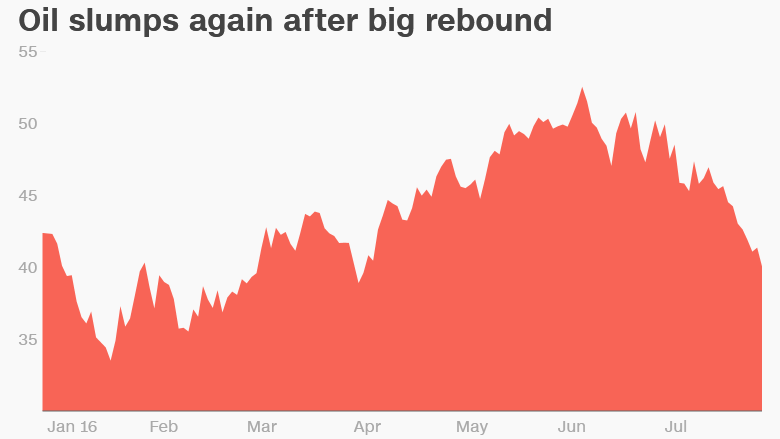 Oil prices are now down more than 22% since topping out above $51 a barrel in early June. That means the closely-watched commodity is officially back in a bear market. It's the latest setback for oil bulls who thought crude was on a straight shot back to $60 and higher following the crash that began in late 2014. The price had peaked at $107 in June 2014. The recent selling has been driven by a realization that the epic oil glut remains largely intact -- and some U.S. oil companies may make it worse by starting to drill more. Not only is there an historic oversupply of crude, but gasoline inventories are now at record highs, despite the fact that it's summer driving season. The fear is that the backlog will force refiners to dial back their demand for oil, deepening crude stockpiles. 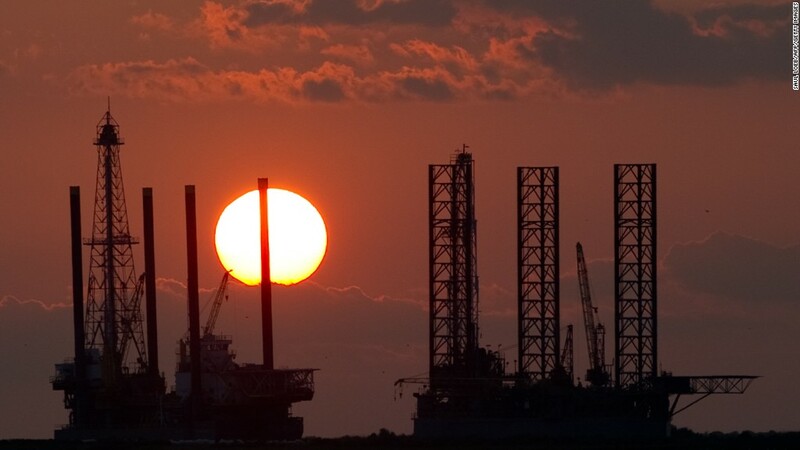 "Crude prices are charging lower to start the week as a plethora of bearish indicators emerge," Matt Smith, director of commodity research at ClipperData, wrote in a note. The oil market was spooked on Monday by reports indicating Saudi Arabia, OPEC's biggest producer, has slashed its selling price in Asia by the biggest amount in nearly a year. That could be a negative signal about demand in Asia, especially China. Another problem for oil: hedge funds are betting against it. Last week, money managers raised their short positions by the largest amount on records that go back to 2006, according to a Bloomberg analysis of Commodities Futures Trading Commission statistics. The energy markets have also displayed nervousness over increased drilling activity in the U.S. The Baker Hughes rig count rose last week for the fifth week in a row, a sign that American drillers have been emboldened to drill more. That doesn't count the thousands of drilled, but uncompleted wells in the U.S. that can quickly be tapped. Vincent Piazza, senior energy analyst at Bloomberg Intelligence, said this "wall of output" should keep a limit on oil prices. "If output can be brought back on, that would be concerning," he said. All of this is great news for American drivers. Gas prices dropped to an average of $2.13 a gallon on Monday, compared with $2.66 this time last year, according to AAA. So how much lower could crude crumble? Oil prices infamously crashed to $26 in mid-February, setting off a global panic over the health of the economy. Michael Wittner, global head of oil research at Societe Generale, doesn't think it'll get that bad this time, predicting crude will bottom out in the high $30 range. "There is a limit to this correction," he wrote.